I seen this a few times and always found it rather unconvincing, I wonder if this is an example of the quality of his forgeries, how museums got taken in. I've read a couple of Victorian accounts of stone objects and they mention that the manufacture process back then was a complete mystery. So I guess anything remotely knapped would be considered authentic. 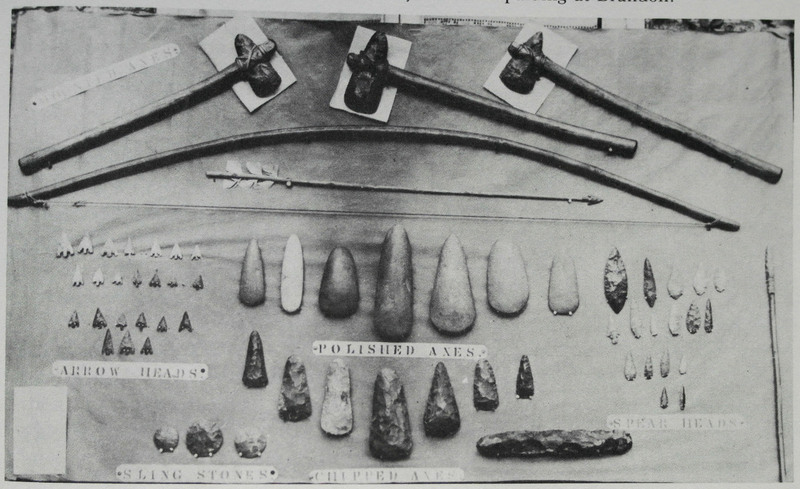 I suppose if he could get away with that standard, why put more effort into knapping. I've always thought he must have done some better quality work, that example above is so crude I wonder how it fooled people even back then. This museum has put a far superior example of his work on display. A much better effort, but he seems to have used exactly the same method of knapping as with the one above. He also seems to have added a fake patina. Pity the picture is so grainy I can't tell whether the concave appearance it has in the centre is just that an appearance, real and natural or real and man made, I even tried viewing it in 3D, but no help. It is very hard to tell, but it does seem that he only did as much knapping as he needed. It does appear to be concave, but does appear to be possibly more by luck than judgement. Some more 19th century fakes in a Scottish Museum. Interesting flake scars, I wonder what tool they were using? 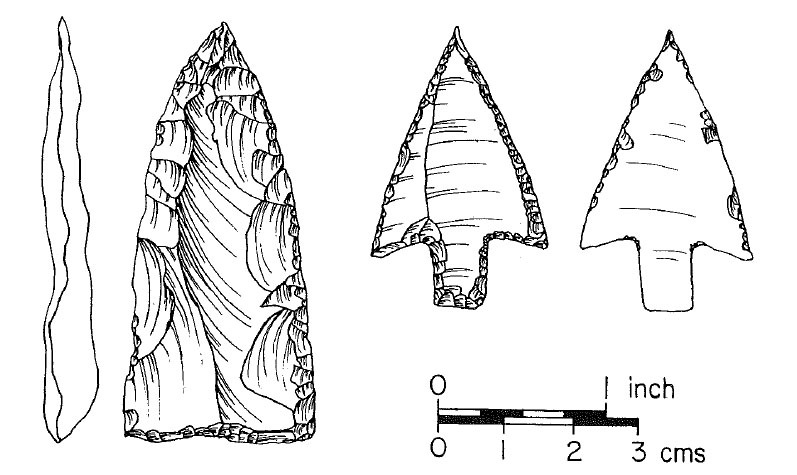 The Flint jack barbed and tanged arrowhead is just knapped from a banana flake and he's just chipped around the edges with no attempt to knap the piece flat. 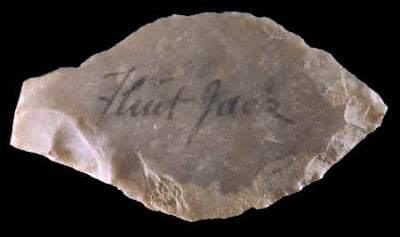 He used a bent piece of thickish steel wire to do the fine flakes and hit the flint directly with this crude tool. No pressure flaking here! God knows why Musuems at the time where fooled by his work and he was eventually mocked for his forgeries and then revered for his "skill"..Urf! It is amazing how poor all the examples of his work are. I believe there are examples or at least pictures of John Evans work, which would predate Jack's. I wonder how they would compare? Here's some 1889 attempts by Brandon knappers, they appear to be very similar in methodology. This guy wasn't from Brandon but nearby, he's pretty amazing, but as to when he actually did the work, dates are ambiguous. that is a nice bit of knapping - the flint has a nice ring to it as he moves it around - not like the thud mine makes. That looks like the better stuff I get from the beaches. Aww bless, it was harder than he's used to!